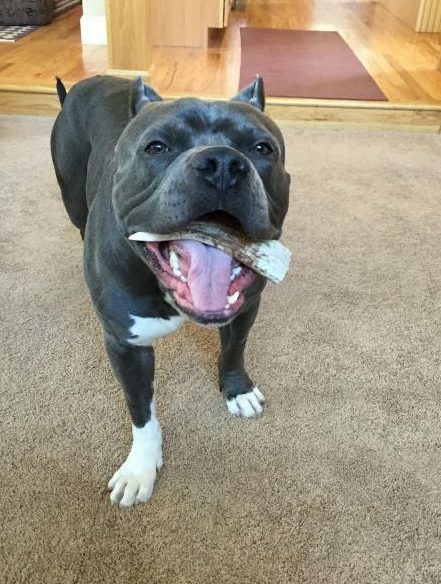 This is Lenny! We have been lurking around the site for a few weeks acquiring a great deal of useful information, and we are so thankful that this site exists. We’re just finally getting around to doing a post. We fostered Lenny for our local humane society right after his Dec 28 amputation, and fairly quickly decided we couldn’t give him up. We finalized the adoption last week. The background details for his history are a bit vague, but it’s our understanding that he had a problem with his hip that was likely congenital. They initially intended to do a hip surgery, but upon doing xrays found that his knee was pretty damaged too…so it was decided to take the leg. Apparently he had little muscle tone in that leg, indicating he had not really been using it for a good while anyway. Which probably explains why he was immediately quite nimble at getting around post surgery. We’ve had him seen by a local rehab vet, who said he’s really in fantastic shape – overall strength is good, ortho exam on his other 3 legs looked good as well. We will go ahead & start him on Adequan + a hip&joint supplement, with the hope that these might help protect those joints proactively. (We have used adequan with our other dog after her knee surgery and felt we saw some benefits). @binkycat graciously donated the red harness he’s wearing in the 3rd picture on the Angel Exchange, and we say a thank you to Angel Lucy every time we use it to help hoist him in & out of the car. We have ordered & received some of Dr Buzby’s toegrips, and we went to get his toenails trimmed yesterday so now will attempt to tackle putting those on. I’ll report back as to how that goes. We have rugs placed here & there in the house, and half of it is carpeted anyway, but we do still have a few patches of hardwood where I’m hoping these might be of help. We also ordered two kinds of socks with grippy stuff on the bottom – the Woodrow Wear ones discussed on this site, as well as some from Expawlorer. We primarily wanted them to slip on for outings such as vet appointments, etc. The Power Paws from Woodrow Wear seem to fit right, and stay on OKAY, but they seem to rotate around such that the silicone grippy stuff moves around to the top of the paw. The Expawlorer ones came with velcro bands to put around the top to keep them on…but I realized when I received them I goofed up on the sizing, so I’ll have to exchange those. I’ll report back on those also. One of my primary questions right now is about doing training with him. He’s a strong guy and pulls a lot on leash. I know tripawds do better moving along a little faster instead of walking slowly, so I am not quite sure how to go about teaching him to walk in a heel position — or if that will even be feasible. Some of the tricks we learned in obedience class to teach our other dog to behave on leash also seem to have the potential to pull him off balance. Because of his breed we feel it’s very important to have a well mannered dog, but I think we may have to adapt some of our previously-used training processes for him. 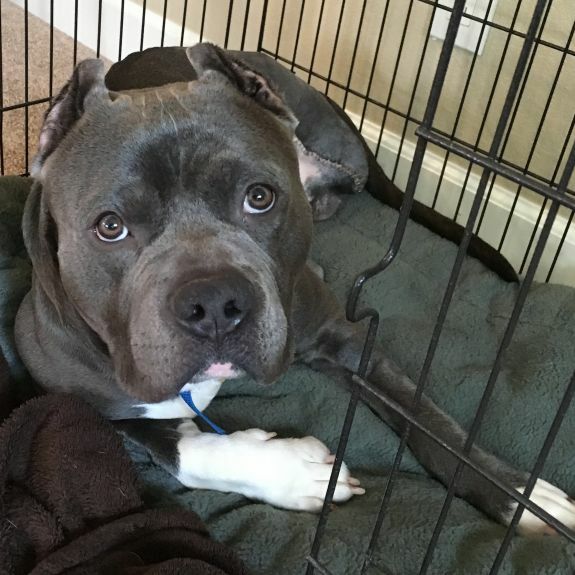 We plan to take him to obedience class before long, and hopefully they’ll have some suggestions for us, but if any of you have advice on this topic, I’d love to hear it. That’s all for now, but I’ll update if I have more “reviews” on any of the equipment we’re trying. Many thanks again for all the helpful suggestions on this site – we have learned a LOT! Welcome and thanks for sharing these details! Please feel free to submit any more detailed product reviews for publication in the Tripawds Gear blog . Hi Amy and Lenny, welcome! About how old is Lenny? And a question about using adequan for your other pup’s knee surgery- how long did you use it for that? I ask because I haven’t really heard of it being used after a surgery. Maybe because it is so expensive it’s not often prescribed for post surgical use? I used it for a couple years with my quad-pug Tani. She had terrible arthritis and after using supplements first (she was diagnosed at 6), then adding low dose rimadyl and slowly ramping that up we tried adequan injections. It was like magic for her- it got us almost 2 more years! Although she is small she is faster than I am. I usually let her walk out in front of me a little and she has learned to stop and sniff so I can catch up. I have taught her to heel, our command is ‘with me’, and she will hop by my side when circumstances dictate. I know it is easier on her to go faster so I try and limit the amount of time she is in a heel- but when around other people and/or dogs and in some of our classes it is important. I do have a slight advantage in that she is skittish so will stay close to me in crowds (which for her is more than 2 people), although as she gains confidence and gets braver she doesn’t always stay with me on her own. You might consider attaching his lead to the front loop on the harness. When he pulls that should gently pull him around to you without making him lose his balance. When Elly goes into ‘sled dog’ mode and pulls hard on the leash I stop walking. She has learned that she has to come back to me and wait until I tell her she can go again. I also learned in one of the classes I took with my other dogs that if they pull hard you reverse direction. I do use that with Elly sometimes when she has trouble shifting into the ‘with me’ pace. I tell her to ‘turn’ and she comes around and we go the other direction until she finds the right pace. I would also recommend that you work on Canine Good Citizen with Lenny. There is a 10 item test that the dog and handler has to pass. I did it with Elly because she was so skittish around people- several of the test items required the evaluator to touch her. The last item is a 3 minute supervise separation which was the hardest thing for us, Elly has separation anxiety. I found that the prep class for the test, then practicing for the test gave us specific skills to work on and master. As far as the traction issues- I have chosen to go with lots of rugs, although I don’t have any hardwood floors but I do have lots of tile. I have not tried the toe grips so can’t comment on how they work. I tried grippy socks with quad-pug Tani but since she sometimes dragged her feet they didn’t work for her. When I had to take her to the vet with their slippery floors I used PAWZ booties- but they are only for short term use. With my two Tripawds I found that at home traction on the floor (rugs and mats) were the best option so I didn’t have to worry about keeping something on their feet. I did keep nails short and fur trimmed short between toes and pads and for my first Tripug Maggie I used Musher’s Secret with some success. Elly navigates the tile just fine when she needs to although she will usually stay on the rugs. Lenny is beautiful!!! I absolutely adore those dogs. You are both right about manners, it took me a good time to teach Rosie manners because she was just so excitable and active. I would like to make a suggestion, I do not know how well it will work in your circumstance. They make a muzzle harness called Gentle Leader. I have used them on a few dogs and had very good luck. 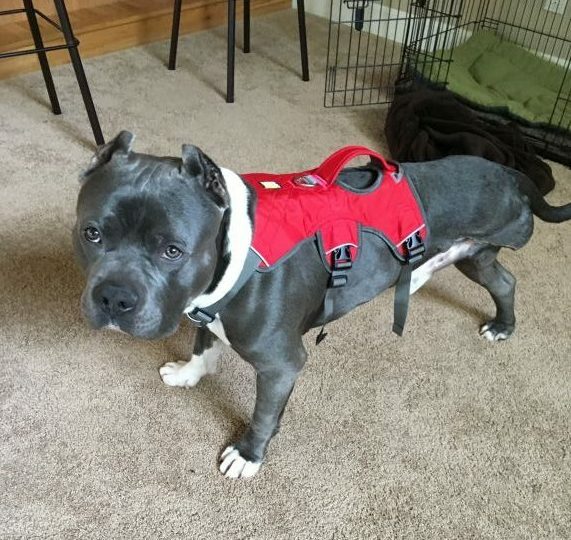 I have used the no pull chest harnesses but when you pull back they are made to make your dog sit and I do not think that would be good in your case. Gentle Harness has been around for a long time, check it out and see if you think it would help him to walk better with you. If you do try it and it works well for you, I would love to know! You’ve gotten EXCELLENT suggestions from Karen and Jackie! I can only add DITTO! Lookie forward to following all pf Le ny’s adventures! Znd the name just fits him so perfectly! You might consider attaching his lead to the front loop on the harness.
. The Webmaster like you are using (Elly too) does not have the front loop. I use a different Ruffwear harness for my quad-pug and it has the front loop. I thought of another training method that was suggested in one of my classes- keep a handful of treats by your hip where you want him to be while in ‘heel’. Start with one or two steps and give a treat if he stays where he is supposed to. Gradually extend the number of steps you take between treats. Eventually you eliminate the treats. I couldn’t make this work for me and Elly because she is too short and all the bending over to reward her was hard on my back. No one method works for everyone- try lots of stuff until you find something that works for you and Lenny. Thanks for all the suggestions, guys! I forgot to mention in my first post, Lenny is supposedly about 3 years old. And I have been applying the Musher’s secret once or twice a week in the hopes of softening up his pads – they are kinda scaley and rough right now. He thinks it’s delicious. We tried pretty much every training collar/harness in the book with our other dog b/c she was such a puller, so I am indeed familiar with the Gentle Leader. The one we have is too small for his giant face so we’d have to get a bigger size. I have (to be honest) not tried much training in earnest with him yet – wanted to be sure he’s fully recovered. Since he’s now sprinting about the yard, I think it’s time! I will probably first try just traditional training with a treat bag etc. He’s a little hyper and very strong, so we may well end up needing some kind of special collar for him. He is a good listener and is very food-motivated, though, so I am hoping he will do okay without yet more special equipment. The method we were taught in the past, when the dog started pulling, was to start jogging backward to bring him back to you (similar to reversing direction, for the dog anyway), but I am afraid of pulling him off balance. So we shall see…..
@Karen, like you, most of his walks will be loose leash, but there are always those situations amongst other people or dogs where he’ll need to stay closer. Unlike Elly he is a complete social butterfly and wants to meet every person and dog in the vicinity, so I will at times need to keep him reigned in. He loves going out & about so we want to do that fairly frequently. Our other dog has her CGC and that is something I’d love to work toward with him also! Re: the Adequan, the rehab vet suggested it for the other dog because she is 10 years old, and already had a few signs of at least mild arthritis in >1 leg. We were hoping to help with the healing of the operated knee joint as well as keep the other 3 legs working as well as possible. She needs 1 cc per injection and while the loading dose (2x/week for 4 weeks) was rather pricey, now that she is in the maintenance phase she only gets 1 injection per month and that seems to do her just fine…it works out to maybe $13-14 per month — not bad. Lenny will need a wee bit higher dose than her.